Lexington, KY, (July 25, 2018) — Atmospheric particles with high water content also known as aerosol droplets are widely found on Earth and play a significant role in the planetary chemistry and meteorology. These particles are generally produced in relatively clean air after emissions of gases that nucleate and condense. Many times this process is dominated by organic acids that have been observed in heavily polluted cities. 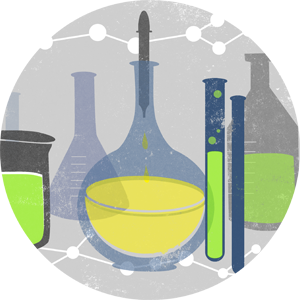 A challenging matter that has recently attracted the interest of many experts is the unknown mechanism by which organic carboxylic acids dissolve from the gas phase into such aqueous particles. In the new work by Prof. Marcelo Guzman and his students Alexis Eugene and Elizabeth Pillar at the University of Kentucky in collaboration with A.J. Colussi from Caltech, micrometer-sized droplets were used to show that acetic acid and pyruvic acid behave as stronger acids on the air-side on the surface of water than when they are dissolved in bulk water. For this purpose the researchers used online electrospray ionization (OESI) to generate microdroplets, in a process that was dominated by pneumatically assisted aerosolization of liquid samples at fixed pH. The microdroplets in OESI were impacted by acid molecules from the gas-phase before the ions were generated and detected by a mass spectrometer (MS). The technique enabled the efficient observation of one of the most fundamental chemical reactions, the transfer of protons from the acid molecules to the surface of water. Marcelo Guzman’s group at the University of Kentucky stumbled upon microdroplet acidity enhancement while trying to analyze samples by OESI-MS. 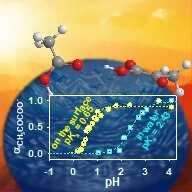 The researchers noticed that acetic and pyruvic acid molecules were both stronger acids on the surface of water. “They were presumably more prone to transfer a proton as they reached the surface of water coming from air, even more than 50 and 500 times”,” Guzman says. The researchers concluded that the behavior and stability of each acid and base pair at the interface played an important role in this phenomena. The results of this work will help to interpret how common carboxylic acids found in aerosols, clouds and fog waters behave in the atmosphere and contribute to design strategies for reducing air pollution. Reference: “Enhanced Acidity of Acetic and Pyruvic Acids on the Surface of Water” by Alexis J. Eugene, Elizabeth A. Pillar, Agustín J. Colussi, and Marcelo I. Guzman. Langmuir, DOI: 10.1021/acs.langmuir.8b01606.